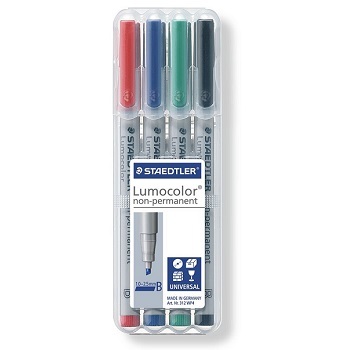 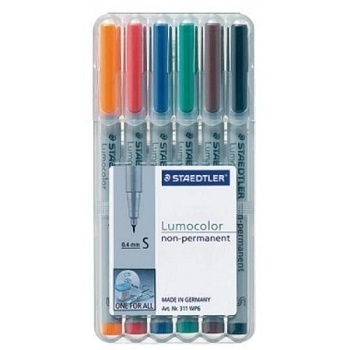 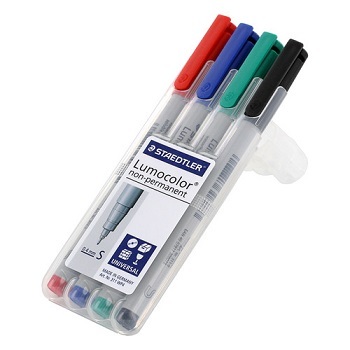 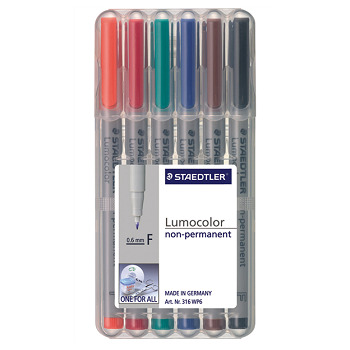 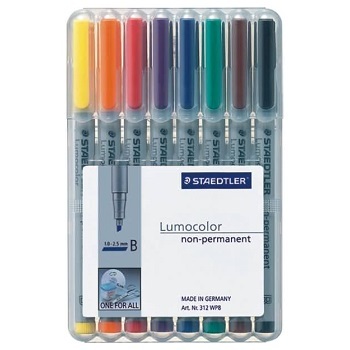 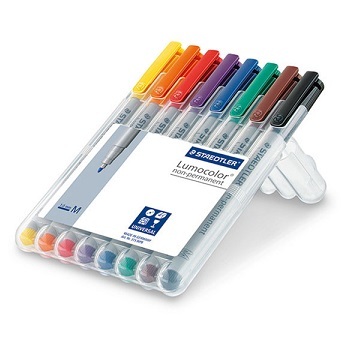 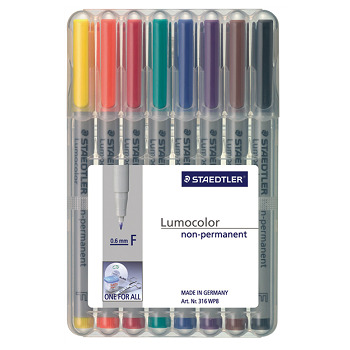 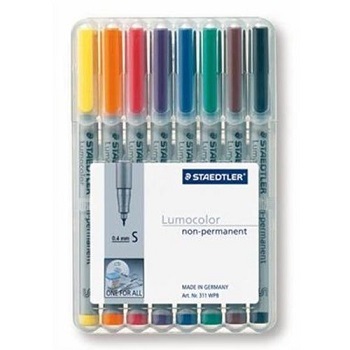 STAEDTLER Lumocolor® non-permanent universal marker pens for use on overhead film and almost all surfaces. 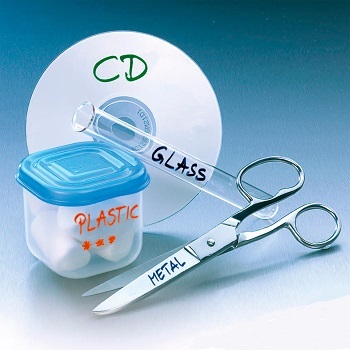 Ideal for OHP acetate film, but also a useful pen for erasable marking of most plastics, laminate, glass, glazed ceramics, whiteboards and plastic noticeboards. 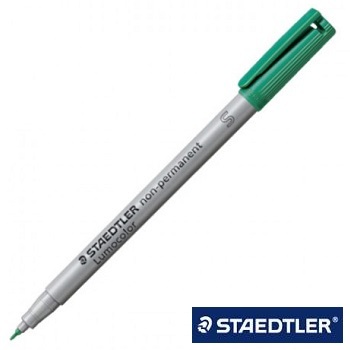 The world's first ever OHP pen is the market leader in many countries and is used in almost every imaginable field of application. 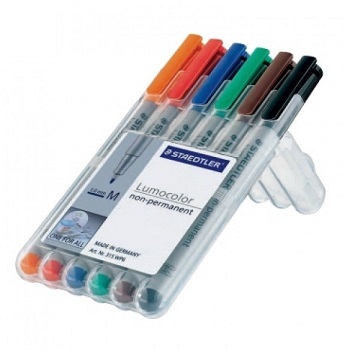 The pens are non-permanent with water-soluble ink which dries in seconds with superb colour brilliancy. The water-soluble ink wipes off shiny surfaces with a damp cloth. 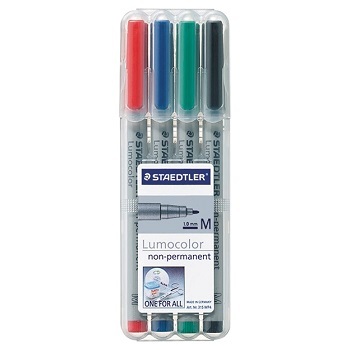 Available in a choice of 4 nib sizes, each of which is available in 8 colours. 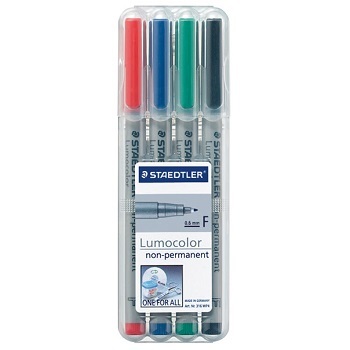 One for All... STAEDTLER Lumocolor 311 Non-Permanent Universal S Marker Pens Superfine point. Universal pen for use on almost all surfaces, suitable for OHP and whiteboards. 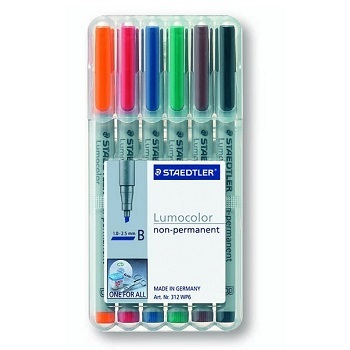 Water-soluble, fast-drying ink with superb colour brilliancy. Can be wiped off any glossy surface using a damp cloth. 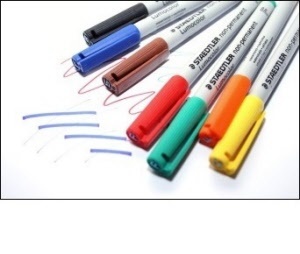 Non-permanent markers in single colours or assorted wallets. One for All... STAEDTLER Lumocolor 316 Non-Permanent Universal F Marker Pens Fine point. One for All... STAEDTLER Lumocolor 315 Non-Permanent Universal M Marker Pens Medium point. One for All... STAEDTLER Lumocolor 312 Non-Permanent Universal B Marker Pens Broad chisel point.